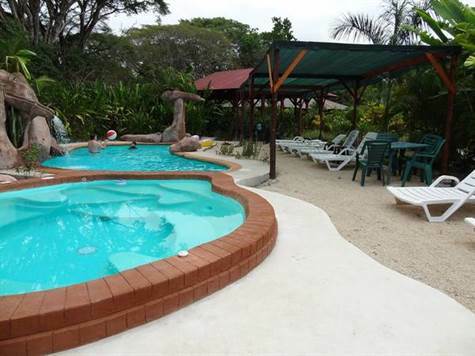 Former retreat center on 4,000 square meters of tropical paradise, would make beautiful spacious home or spectacular bed and breakfast style retreat. The Casa: Four large bedrooms (three with air conditioning) , three gorgeous bathrooms with artisan concrete work, beautiful commercial size kitchen with artisan concrete counter and bar that seats 8, spacious terrace with dining area and spacious living room area, interior living room, small terrace, safe room to store your valuables. Location: Located at the end of a dead end road, offering complete privacy and tranquility, yet only 200 meters from a market, short stroll to several excellent restaurants, bakery, another market, the ocean, a national park, a snorkeling island, tide pools, and waterfalls. Cabuya: Cabuya remains a very tranquil fishing village, located at the southern tip of the Nicoya Peninsula at the entrance to Cabo Blanco National Park. It is unique in Costa Rica, there is no large scale development here, really no development at all other than small casas and several businesses. There is however, plenty of ecotourism, including, hiking, snorkeling, horseback riding, sup boarding, surfing, adventuring.